The stylish TV show is quickly evolving into a full-on brand that marketers are drooling over. Admire the sultry curves draped just so by sharp tweed fabric that leaves everything to the imagination. Smoke swirling inside what you can just make out to be the cold industrial lines of an office. A glass of scotch just outside of frame. And I don’t think she has any clothes on under that trenchcoat. Somebody get me a cigarette! But that’s not Joan Holloway, that’s Christina Hendricks, the actress that plays her on Mad Men. And it’s not Mad Men, but rather an ad for London Fog. Confused yet? If so, you’re forgiven: A bit of time-space displacement is understandable, since London Fog (or the 1960’s version of the brand) was featured prominently in a recent Mad Men episode. While Mad Men has slyly slipped plenty of product placement deals into its show, this is the first time a Mad Men actor has appeared in an ad for a product previously hyped on the show, making for a novel kind of symbiosis. In fact, London Fog was actually first approached by Mad Men last season to work the brand into the show, says Dari Marder, Chief Marketing Officer of the Iconix Brand Group. “They went through archive ads, materials and product,” she says. “We were thrilled with how it turned out, the integration was seamless.” One could say the same thing about the London Fog ads. Hendricks is the front-runner for her best-supporting actress Emmy (against co-star Elisabeth Moss, no less!) and just snagged Esquire’s cover of its Women We Love issue, so the ads seem perfectly timed to capitalize from her skyrocketing fame and her evident glamour. And what about associating with the cachet of good advertising? Mad Men actor Jon Hamm lent his voice to an ad for Mercedes-Benz that debuted during this year’s Academy Awards. Here we have the curious case of a fictional ad creative delivering a real ad. His words are delivered in the same confident, hypnotic tone that he used to deliver that winning (fictional) Kodak Carousel pitch. It’s not all that tough to pretend that, were hybrid vehicles around in 1965, Don Draper would write copy like: “What drives us to create the world’s first hybrid sedan powered by a compact lithium ion battery?” And that’s exactly what Mercedes wants you to hear. 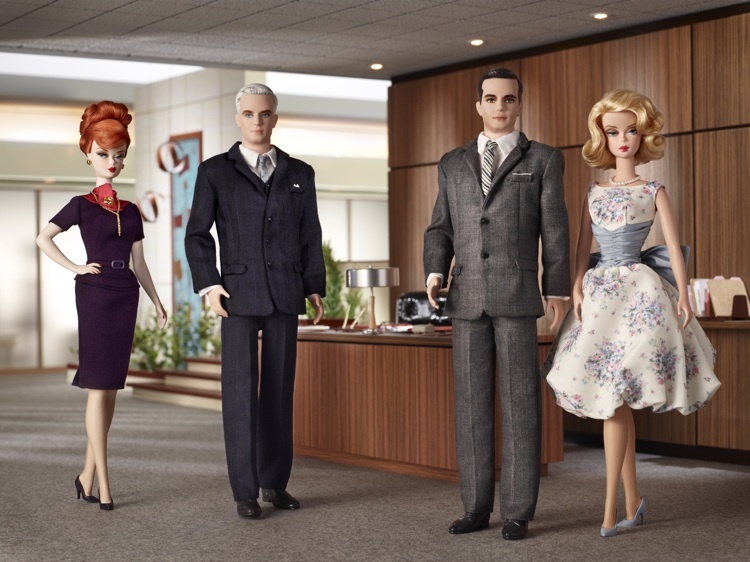 Of course, the highly-stylized look of Mad Men has also become a coveted aesthetic. Up for her second Emmy this weekend is Janie Bryant, costume designer for the show (and an Emmy-winner for her work on Deadwood), and the one who has been making the most of her Mad Men success. Bryant just inked a deal with Maidenform for a social media campaign, “educating women on the proper fit and function of their intimate apparel wardrobe,” according to Lucille DeHart, chief marketing officer of Maidenform. With perky brassieres and suffocating girdles in nearly every shot, it seems like a natural tie-in with the almost 90-year brand, but Maidenform’s deal with Bryant stresses that it is in no way affiliated with or endorsed by the show. But obviously, it still looms unspoken in the background. When it comes to actually pushing product, Mad Men has shied away from making such a direct correlation between brands and its actors. Creator Matthew Weiner’s vice-like grip over every aspect of the show, from demanding specific colors of car interiors to painstakingly rewriting every script, has inspired him to turn down plenty of bad sponsorship ideas according to a New York Times article. One which notably made the cut earlier this year was a line of four Barbie dolls in the likeness of four characters. For only $75 each, kids can reenact all the infidelities of Don, Betty, Roger and Joan. A line of Brooks Brothers Mad Men Edition suits, designed in partnership with Bryant retailed for about $998, and appear to have sold out. The Mad Men suit boosted its sorry suit sales, according to brandchannel, a win for Brooks Brothers, but Millman thinks it was a bad move for the Mad Men brand. “The Mad Men vernacular at its best is representative of a glamorous time long past,” she says. “It is a mistake to jolt people into reality by trying to sell them processed glamour to make a quick buck.” Which is why London Fog says they’re not ruling out a line of Joan-inspired coats. So does Hendricks’s campaign pave the way for more of Sterling Cooper Draper Pryce employees to hype the products featured on the show? We can’t see any problem with Roger Sterling shilling for Stoli (since we’re guessing Lucky Strike is out of the question). Curiously, another Mad Men character has recently popped up in TV ads: Elisabeth Moss talking headaches for Excedrin. One problem: Moss actually shot these in 2005, before her turn as Peggy. Excedrin just happened to start airing them again. It’s a shame really. Just think of what wonders she could have done for Trojan.